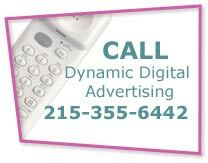 A main custom website design company in Pennsylvania, Dynamic Digital Advertising gives clients a professional website design and website development procedure that includes fourteen defined stages. Each stage is indispensable to DDA websites receiving better scores on the search engine leaders like Google, Yahoo, and MSN as well as to turning a significant amount of web site traffic into real-world business. Dynamic Digital Advertisings professional website design procedure makes use of tools such as search engine optimization, search engine optimization copywriting, competitor marketing analysis, planned architecture, and keyword research services, and also involves post-launch services such as usability analysis, metrics tracking, and reliable website hosting. A main graphic design firm in Pennsylvania, Dynamic Digital Advertising, has prepared many different graphic design marketing services that actually composes one of the widest ranges of graphic design services in the United States. Included in the expanse of Dynamic Digital Advertisings graphic design services are large format graphic design for billboards and truck signs, 3D illustration and animation, virtual reality and 3D product rotation, print media for brochures, business cards, catalogs, calendars, e-brochures, and more, and aesthetic web graphic design. DDA also puts clients into contact with DDA graphic design artists who are proficient in designing exceptional images for many different industries. struggling to get people to find your medical products and devices. But now, with click-to-pay video ads and pay-per-click management from Dynamic Digital Advertising (DDA), it has never been easier to promote your website to the top of the major search engines and sell your medical device. With a full-time staff of degreed writers and a complete in-house video production team, we can write pay-per-click ads that appeal to your customer base and create a new video to showcase the device or facility. Our video production crew can handle everything from pre-production to post-production processes, including storyboarding, video editing, special effects (FX), and 2D and 3D animation. Of course, we will be able to take your short video clip and format it to a click-to-pay video ad now featured on the tycoon search engine, Google. By showing off your latest medical device with pay-per-click advertising, not only will you be found on the front page of any search related to your keywords, but you will also have a unique video to show off your medical device before viewers even reach your website. With a compelling and engaging short video, Internet surfers will be intrigued by the device in promotion and follow your website to learn more. And compared to the text-based ads currently used, the video will stand out even more. With millions of indexed websites, it’s a difficult task to promote your latest medical device on the major search engines. But with the ease of pay-per-click advertising and the latest click-to-pay video ads, you can easily make your site found. Let DDA properly manage your video and pay-per-click ads to market your device at an affordable price with high conversion rates.